Europe's refugee mess is back with a bang. On Thursday, out of the blue, Italy's Deputy Prime Minister Luigi Di Maio threatened to stop financial contributions to the European Union next year unless other states agreed to take in migrants being held on a coastguard ship in Sicily. The Italian's ultimatum comes less two months after Europe triumphantly announced a "vaguely worded" deal on how to resolve the continent's migrant influx. “If tomorrow at the meeting of the European Commission nothing is decided on the redistribution of migrants and the Diciotti ship, I and the entire Five Star Movement are not willing to give 20 billion to the European Union,” Di Maio said in a video posted on his Facebook page. Salvini described those aboard as "illegal immigrants," and said they won't be allowed to step foot on Italian soil. Instead, he insisted fellow European Union nations take in some of the asylum-seekers. "Italy's no longer Europe's refugee camp," he tweeted. "Upon my authorization, no one is disembarking from the Diciotti." Salvini, who is also interior minister, was defiant in the face of a criminal probe into possible kidnapping charges for forcing the migrants to remain on the vessel. The chief prosecutor from the Agrigento court, Luigi Patronaggio, on Wednesday boarded the Diciotti and said afterwards he had opened a probe against “unknown” persons for holding the migrants against their will. “There’s a court that is investigating whether those illegally on board the ship have been kidnapped,” Salvini said in a radio interview. A public backlash against the arrivals of hundreds of thousands of seaborne newcomers in the past five years - a consequence of policies established by Angela Merkel in 2015 - helped put Di Maio and Salvini into office. Salvini allowed 27 unaccompanied minors off the ship late Wednesday. Meanwhile, the European Commission said this week that it is working to find an agreement. Other such deals were found in June and July for ships carrying rescued migrants that docked in both Italy and Malta. This is not the first time Italy has clashed with Brussels on this issue. In June, Salvini refused to accept the Aquarius boat with its load of 629 migrants. At the time Spain agreed to let the boat dock. On Wednesday Premier Giuseppe Conte said on Facebook that promises made by EU partners in the past had not been kept. He said only France had taken a few migrants in, while Germany, Spain, Portugal, Ireland and Malta, which had previously offered to share some of the burden, were not doing so. Italy is “waiting for a strong and clear answer from the European institutions and an adequate response from the other European countries,” he said. 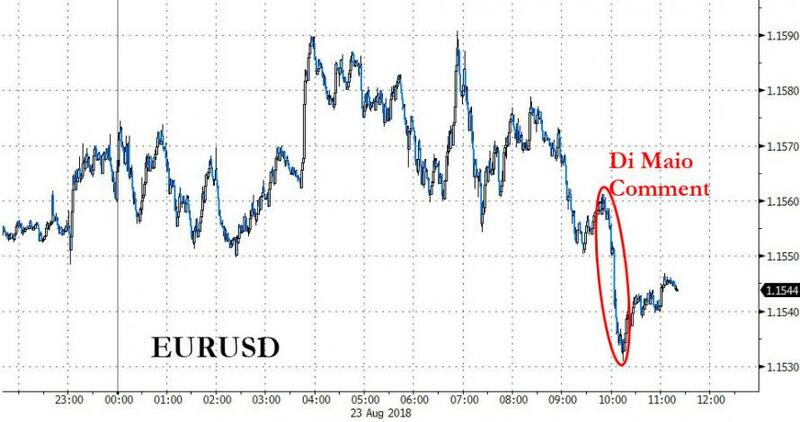 Following news that Italy has once again broken apart with Brussels over the sensitive issue of how to deal with the ongoing migrant wave, the EURUSD slumped to session lows as the market slowly realizes that - as we said in June - Europe's migrant problem is unsolvable. Siding with his Italian colleagues, Hungary's Foreign Minister Peter Szijjarto said on Thursday after meeting Italian counterpart Enzo Moavero Milanesi that the Italian and Hungarian governments' policies on migration are identical on a multitude of points. "The Hungarian government cooperates with everybody who seeks to stop illegal migration and prioritizes border protection," Szijjarto told MTI after his meeting. The position of the new Italian government and the new Italian Interior Minister, Matteo Salvini, coincides with the Hungarian government's in many ways, he said. "We agreed that the root causes [of migration] must be addressed ... and entering Europe must be done according to European rules." Hungary maintains that migrants should not be distributed among EU countries but should be prevented from coming to Europe in the first place.